Composer, conductor, musical theorist and advocate for the cutting edge, beginning in the 1950s Pierre Boulez was a voice to be reckoned with in nearly all aspects of classical music. Now that voice has been stilled, just the latest lost from the adventurous generation that set out to remake music, compositionally or interpretively, after World War II. 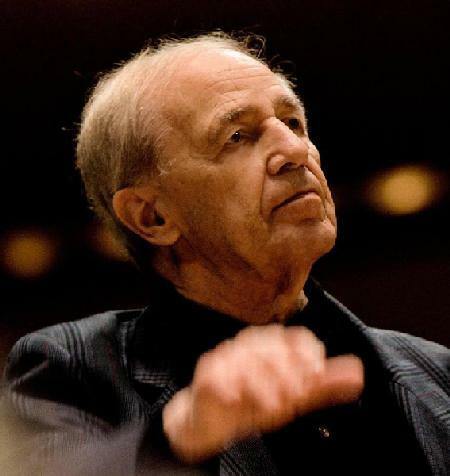 Although he was a staunch defender of the twelve-tone system and an avowed opponent of music from the 19th century, Boulez held major conducting posts with traditional ensembles like the New York Philharmonic and came to be regarded as an important interpreter of Gustav Mahler. He dismissed popular music out of hand, yet he recorded “classical” compositions by Frank Zappa. A curious blend of contradictions, then. In many (or even most) ways, I'm the wrong writer to be offering this obituary; my tastes run to the sort of capital-R-Romantic literature and performance practices that he abhorred. I'm hardly well-versed in his recordings, but that is in part because most of my favorite sorts of music that I heard in his recordings back in his heyday struck me as somehow a bit “cold,” so I never actively pursued them. The day after his passing, I heard a Boulez recording of Debussy's Prélude à l'aprè-midi d'un faune, played in tribute on a local radio station, and I'm prepared to admit that perhaps my earlier judgment was callow. I'd need more exposure to say for sure, however, and time now doesn't permit that. As to his music, it's not the sort of fare that I find appealing personally, and it seems not to have gained much traction outside a tiny fraction of the tiny minority of music lovers who listen to classical, but perhaps it will find its audience in time. For all these reasons, then, and recognizing that Boulez was anything but traditional, I've decided that instead of writing a traditional, glowing obituary tribute, I'll simply collect a few colorful quotations, culled from the Internet, and let the reader reach his own conclusions. Beyond that, all I can say is that the classical music world is a poorer place for his passing.